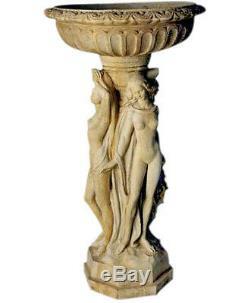 Three Graces Garden Birdbath 33" Product Code: F1105 Weight: 55 lbs (24.9 kg) Dimensions: 18"Wide x 18 x 33"High (46 cm x 46 cm x 84 cm) Made of Fibersone Three Graces Garden Birdbath 33" Made of fiberstone. Fiberstone is a mixture of sand and stones cast into the surface using terrazzo-like techniques. The surface is then sandblasted and chemically treated, and then hand painted with an antique acid stain to give the appearance of aged stone. The item "Three Graces Garden Birdbath 33" is in sale since Sunday, March 24, 2019. This item is in the category "Art\Art Sculptures". The seller is "sculpture_collection" and is located in US. This item can be shipped to United States, Canada, United Kingdom, Denmark, Romania, Slovakia, Bulgaria, Czech republic, Finland, Hungary, Latvia, Lithuania, Malta, Estonia, Australia, Greece, Portugal, Cyprus, Slovenia, Japan, Sweden, South Korea, Indonesia, Taiwan, South africa, Thailand, Belgium, France, Hong Kong, Ireland, Netherlands, Poland, Spain, Italy, Germany, Austria, Bahamas, Israel, Mexico, New Zealand, Philippines, Singapore, Norway, Saudi arabia, Ukraine, United arab emirates, Qatar, Kuwait, Bahrain, Croatia, Malaysia, Chile, Colombia, Costa rica, Dominican republic, Panama, Trinidad and tobago, Guatemala, El salvador, Honduras, Jamaica, Antigua and barbuda, Aruba, Belize, Dominica, Grenada, Saint kitts and nevis, Saint lucia, Montserrat, Turks and caicos islands, Barbados, Bangladesh, Bermuda, Brunei darussalam, Bolivia, Ecuador, Egypt, French guiana, Guernsey, Gibraltar, Guadeloupe, Iceland, Jersey, Jordan, Cambodia, Cayman islands, Liechtenstein, Sri lanka, Luxembourg, Monaco, Macao, Martinique, Maldives, Nicaragua, Oman, Peru, Pakistan, Paraguay, Reunion, Viet nam, Uruguay.